Luna Sea is an outstanding Mainship 350/390 that has been updated and cared for by a professional captain. You can cruise all day at 10 knots burning 6.5 gallons an hour or kick it up to a blistering 20 knots top end. She has been completely gone thru top to bottom with following items being just a few of the updates. Luna Sea is turn key in every way just bring your bags and go. Look at the rest then come to buy the best Luna Sea will exceed your expectations. 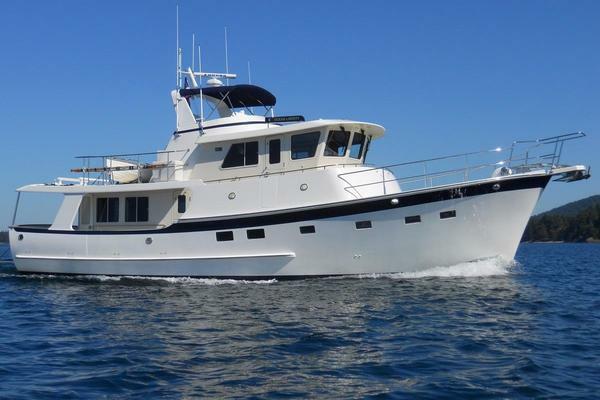 West Florida Yachts would love to guide you through a personal showing of this 39' Mainship 390 Trawler 1998. This yacht for sale is located in Port Royal, South Carolina and priced at $124,900. For a showing please contact us by filling out the form on this page and we will get back to you shortly! The Mainship 390 Trawler blends today's technology with years of experience in crafting thousands of trawlers. Inside the spacious cabin, for example, is a lower helm station that's complete with full instrumentation and a windshield equipped with wipers and washers. The salon features warm teak highlighted by designer fabrics, HDTV, a stereo, and opening windows. Deck access is made easy for shorthanded cruising with a starboard helm sliding door. There is also a large screened sliding door to the cockpit. The 390 Trawler's galley is equipped for cruising or entertaining with a range, an oven, a microwave, a full-size refrigerator, an oversize sink, abundant cabinets and Corian countertops. The large master stateroom has a center island bed, cedar-lined hanging lockers, an opening portlight and hatch, and again more storage. For guests, a second stateroom features twin berths along with a hanging locker, storage, an opening hatch and a portlight. And finally, the easy cleaning, molded fiberglass head offers a built-in vanity, a shower, an electric marine toilet, an opening hatch, a portlight and a mirror. The power to travel is provided by twin yanmars. On the flybridge there is a large area for entertaining or lounging, seating for more than six, and a drop-leaf table. The center helm has great visibility, full instrumentation and plenty of room for electronics (note the radar mast). This deck is reached by a wide, molded stairway with a full handrail. Access forward to the anchor is protected by a high bulwark and a walk-around deck. In the cockpit there is more than ample storage with deep wells and a lazarette. Luna Sea sleeps 2 in the master v-berth forward and 2 in the midship guest stateroom. Below you will also find a large head with walk in shower. The galley features new appliance in 2018, fridge, freeezer, oven and stove. The salon has a new HDTV and seating added 2018. Just aft in the cockpit you will find 3 deck chairs to enjoy some shaded time outdoors as well as a stainless steel magma grill. Electronics have been completely updated and gone thru. Luna Sea has the following additional items to complete the perfect cruising or live aboard boat.